Looking for Thermal Overload Relays? Get a quote fast. Protect your motor from dangerous overloads. If your motor circuits can’t stand the heat, it’s time to get a thermal overload relay. Thermal overload relays are some of the most popular types of relays in the industry. As opposed to electronic relays, they utilize a heat detection mechanism to open up circuits in case of an overload. When the heating element inside the relay experiences a dramatic thermal increase, it will subsequently bend the bimetallic strip thus opening up and breaking the circuit, preventing the motor from any overload damage. Thermal overload relays can then be reset either manually or automatically. Used throughout a number of sectors, thermal overload relays are found in HVAC systems, mining systems, pumping systems and irrigation systems among others. As cost-effective as they are reliable. Thermal overload relays are known to be extremely reliable, and provide a high level of protection. IEC relays in particular are also equipped to protect against phase failure, also known as single phasing. This occurs when one of the phases in a 3 phase system is lost and can be due to worn out contacts, defective wiring, and other conditions. This places an excessive amount of stress on the remaining two contacts and can result in serious damage if gone undetected. Thermal overload relays can be equipped with mechanisms that prevent single phasing, protecting both you and your motor from damage. Discover the Bay Power promise today. When you shop at Bay Power, you can always count on us to be as reliable as our high quality thermal overload relays. 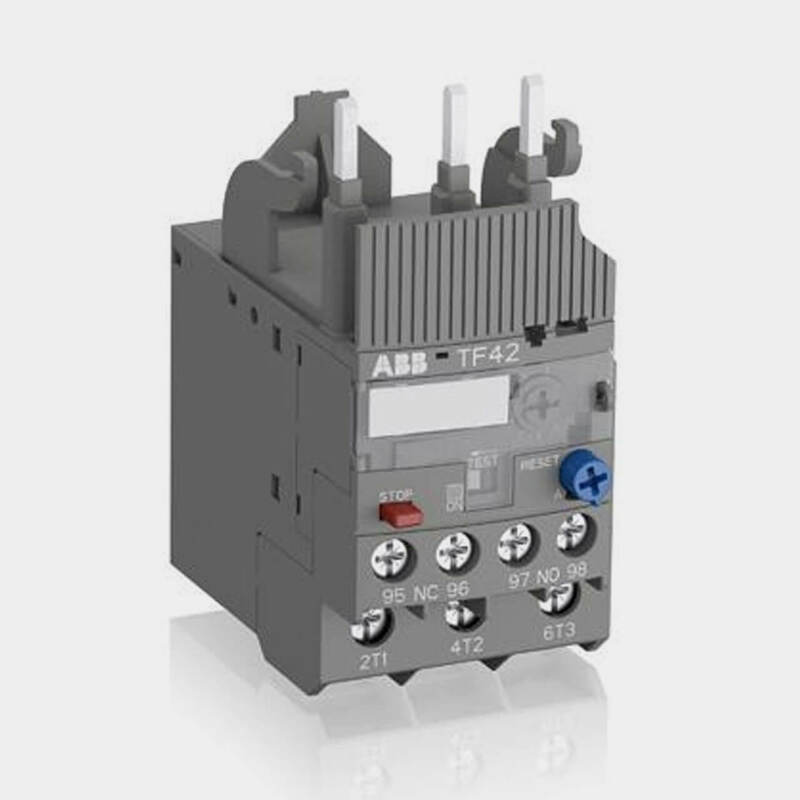 Choose from our vast selection of industry-leading thermal overload relays including Allen Bradley safety relays, Jokab safety relays, Pilz safety relays, Schweitzer protective relays, and more. We also carry thermal overload relays from ABB, Crydom, GE and Thermistor. Shop with us today and take advantage of our extensive selection, quick shipping, expert service, all with a one-year replacement warranty - That’s the Bay Power promise. Have any old or unused General Electric (GE) Switchgear lying around? Don’t get rid of them just yet. While we stock a wide range of quality electrical products and solutions, both new and reconditioned, we also buy back your unwanted equipment. So, before deciding what to do with your old General Electric (GE) Switchgear and components, have one of our expert technicians take a look to see if we can save a few parts, save the environment, and save you some cash. Great service shouldn’t end after the purchase. We pride ourselves on the relationships we build with our customer-first mentality and the quality of our General Electric (GE) Switchgear and components. That’s why we offer a 1-year replacement warranty on all of our electrical products and solutions from the top manufacturers. Because when you buy with Bay Power, you buy with confidence. We are proud to stock a variety of competitively priced, new and reconditioned components from the leading manufacturers of General Electric (GE) Switchgear. Thanks to our extensive inventory of General Electric (GE) Switchgear and components, our resourceful and expertly trained staff will always be able to get the products that you need. Through our extensive network of suppliers, we are able to carry and acquire a huge variety of electrical products and solutions, so chances are if you need it, we can get it. Bay Power’s priority is providing you with reliable, high quality electrical hardware. That’s why our mission is to make sure our reconditioned electrical products and solutions function as perfectly as the day they were built. Because while the quality is high, the cost of General Electric (GE) Switchgear shouldn’t be. Our selection of new surplus General Electric (GE) Switchgear may not arrive brand new in a box, but they function just as well, and have never had electricity run through them. All of the quality, none of the packaging, always with our 1-year replacement warranty.